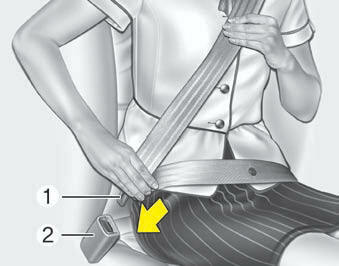 For maximum restraint system protection, the seat belts must always be used whenever the vehicle is moving. Children age 12 and under must always be properly restrained in the rear seat. Never allow children to ride in the front passenger seat. If a child over 12 must be seated in the front seat, he/she must be properly belted and the seat should be moved as far back as possible. Avoid wearing twisted seat belts. A twisted belt can't do its job well. In a collision, it could even cut into you. Be sure the belt webbing is straight and not twisted. Seat belts are designed to bear upon the bony structure of the body, and should be worn low across the front of the pelvis or the pelvis, chest and shoulders, as applicable; wearing the lap section of the belt across the abdominal area must be avoided. Seat belts should be adjusted as firmly as possible, consistent with comfort, to provide the protection for which they have been designed. A slack belt will greatly reduce the protection afforded to the wearer. Care should be taken to avoid contamination of the webbing with polishes, oils and chemicals, and particularly battery acid. Cleaning may safely be carried out using mild soap and water. The belt should be replaced if webbing becomes frayed, contaminated or damaged. Belts should not be worn with straps twisted. Each belt assembly must only be used by one occupant; it is dangerous to put a belt around a child being carried on the occupant's lap. 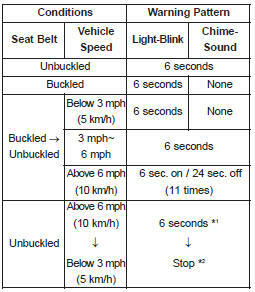 The driver's seat belt warning light and chime will activate pursuant to the following table when the ignition switch is in "ON" position.